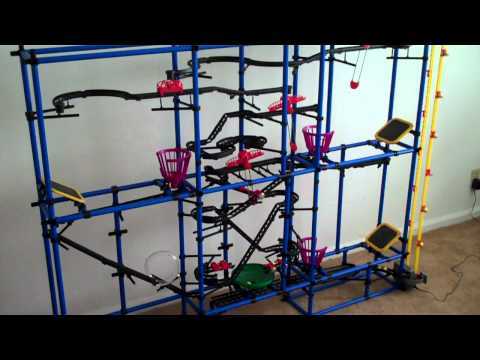 The Chaos Tower is an amazing kit that gives your kids a chance to build just about any structural tower they can dream of and once they are done, they will witness the amazing laws of movement when they finally dispatch the balls into their new maze. Then when your kids go to sleep, it’s your turn! Your children will definitely never move again once they see this kit in action. They construct it using a variety of chutes, slides, funnels, capture baskets… whatever their minds can come up with. The brand-new motor propelled chain lifts a ball to the top and then who knows what will happen next! You are pretty much guaranteed hours of innovative fun with this top-notch, attractively packaged set. The tower has a max height of seventy-eight inches and comes with six hundred and two different components! Generally for ages seven & up. If your kids ever get bored of this kit (and we doubt they will), then you can order additional expansions packs. Click HERE for an example. Looking For Something Other Than The Chaos Tower? If so, take a gander at our Shop for other great gift ideas for kids!